A couple of weeks ago I watched the movie The Railway Man, starring Colin Firth. 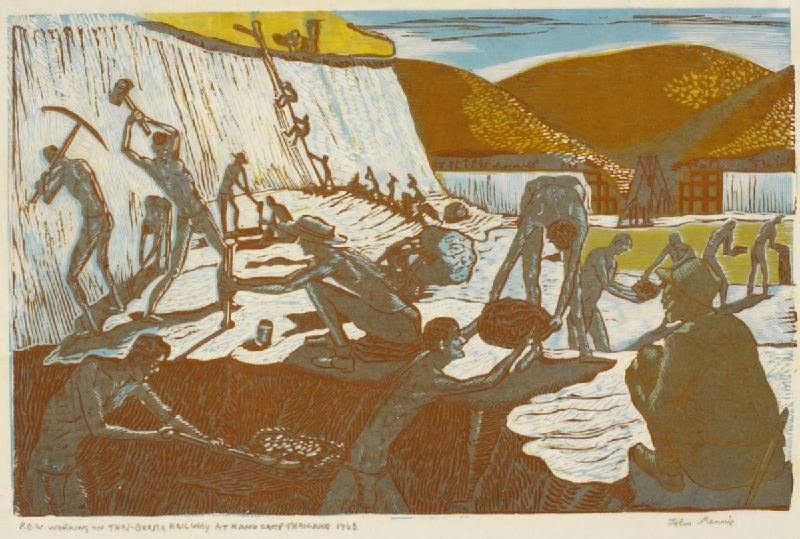 This film is loosely adapted from a memoir of the same title by Eric Lomax, an Englishman who had been a prisoner of the Japanese during WWII and had been enslaved to work on the Burma railway. 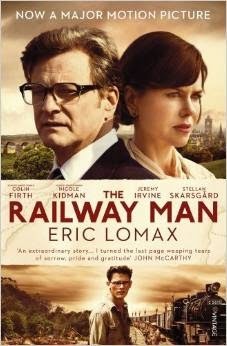 In the film, set in 1980, Eric Lomax is a tormented veteran whose hobby, dating from before he became a prisoner of war (POW), is to follow railway routes and schedules. The film goes back and forth between the elder Lomax and his younger self as a POW. After he is taken prisoner, he draws a map for his fellow POWs to show them where he thinks they are. The Japanese find the map and torture him to reveal for whom he drew it, convinced he is a spy for the Chinese. After the war, he becomes obsessed with revenge against the Japanese. Then one day he discovers that the interpreter for his torturers is still alive and is guiding tours of his former prison camp. He sets off to take revenge on the interpreter but ends up forgiving him. In real life, Eric Lomax did indeed discover that the interpreter, Nagase Takasi, had been trying to atone for his sins during the war. In the real story, Lomax first obtained counseling, then when he discovered Nagase was still alive wrote to him, eventually meeting after several years of corresponding. Lomax did formally forgive Nagase, and they remained friends until their deaths. This story was told in Michael Henderson’s Forgiveness: Breaking the Chain of Hate (Book Partners, Wilsonville, Oregon, 1999), pp. 117-20. After we watched the film, my husband expressed surprise that Lomax forgave Nagase. Under international law in force at the time of WWII, POWs were not supposed to be enslaved, starved, tortured or murdered. Why would you forgive a war criminal who tortured you? Discussion of forgiveness has become popular in the burgeoning academic literature on post-conflict resolution. There is a much criticism of Bishop Tutu, the Anglican South African bishop who sat on the South African Truth and Reconciliation Commission (TRC). Tutu appeared to subtly pressure victims of apartheid-era human rights abuses who testified before the Commission to forgive the perpetrators of these violations. In the documentary film A Long Night’s Journey into Day (if I remember correctly), about the TRC, there is a scene where four black women are asked to forgive the black policemen who murdered their sons, on the orders of his presumably white superiors. The four women discuss forgiveness, noting that they are all Christians, and decide to forgive him. When I saw this film I was horrified. I though the women should not have forgiven the former policeman. It seemed that what he had done was too severe for forgiveness. I realize that forgiveness is valued in Christianity, as it also is in Judaism and probably in all other religions, but I still thought that the women should not forgive and that once they got over their momentary impulse to forgive they would regret it. In the TRC Commissioners’ defense, I believe, once this subtle pressure was brought to their attention they tried to avoid it in the future. I thought a lot about forgiveness when I wrote my article about Official Apologies, which you can find in the open access journal, Transitional Justice Review (vol.1, no.1, 2013), which was founded and is edited by my former student, Joanne Quinn, http://ir.lib.uwo.ca/tjreview/vol1/iss1/9/ I believe strongly that despite Eric Lomax and others like him, victims of genocide, war crimes, crimes against humanity and other such horrors should never be pressured to forgive. Apology (acknowledgement of the facts, taking responsibility for the harm done, expression of sorrow and remorse, promise of non-repetition) → forgiveness→ restored good relations→ increased interpersonal trust→ reconciliation. Forgiveness may well be necessary in an interpersonal apology, and it may well be good for the victim of a wrong to forgive. But I don’t believe, as so many people seem to, that the opposite of non-forgiveness in the desire for revenge, nor do I think that without forgiveness, the victim is eaten up by bitterness. Rather, the victim can simply ignore the perpetrator, or treat him with the contempt he deserves. Many Holocaust victims, for example, simply got on with their lives. I think that for political reconciliation, the model is something like the one below. Apology → victims’ restored sense of self-worth→ restored good relations→ increased social trust→ reconciliation. There is no need for forgiveness in this model. The perpetrator apologies, the victim accepts the apology but does not forgive, and good relations consist of the victims’ not wanting revenge. Perpetrator and victim can interact in the public sphere without further contact. The Eric Lomax’s of the world are few and far between, and victims should not be pressured to act as he did.